show enthusiasts’ bible. Inside you will find all of the car shows, cruise nites and car club listings. 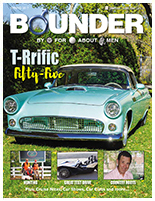 If you love classic and exotic cars and trucks you're going to love this issue. Help celebrate our 10th anniversary in 2019. This year we will be out even more with our event trailer and stage; handing out mags and meeting many of our readers and introducing it to others. Welcome to our Annual Music Edition. 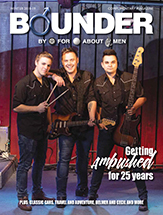 We were fortunate to interview the popular band Ambush as they celebrate 25 years of performing in Ottawa and the Valley. All our regular feature writers are back to bring you great reading for your winter hibernation. Watch for news on our plans for celebrating our upcoming 10th anniversary in 2019. As the song goes "Get your motor running - head out on the highway". 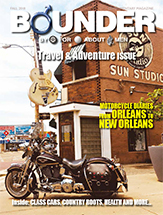 Fall is here and so is our "Travel and Adventure" issue. Pack you bags for all kinds of trips including a great motorcycle trip to the Southern USA to fishing in North Bay and Christmas Island or a European trip to Munich and Prague with our resident wanderer, John Switzer, or tool around British Columbia with Mark Papousek. There's something for everyone! Enjoy! Here comes summer and we have lots of great articles to enjoy at the cottage or on your patio. Had a great time with the dedicated lads of the Bytown Fire Brigade plus we’ve got our annual motorcycle event listings for bike enthusiasts. Read about the Commotions, a great local band that will be playing Kemptville live in July. Enjoy the read and your summer. It's our Annual Wheels Edition and there is a ton of car events this year. 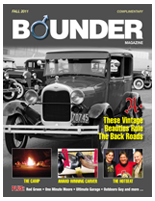 Bounder is pleased to bring you the list of events plus so much more. Outdoors guy Jeff Morrison is back at Bounder and we are so glad to have him back. 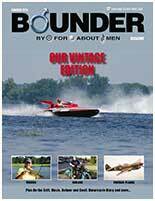 Now we offer more pages of hunting and fishing for the outdoor enthusiasts. Plus, motorcycle diarys, rye, craft beer and more. It's all here. Enjoy. Our annual Music Edition. 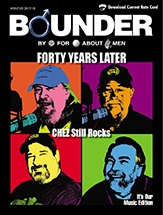 What better way to promote music than to feature local radio station CHEZ106 on their 40th anniversary. Plus an exclusive interview with Les Emmerson of the Five Man Electrical Band and a review of Robbie Robertson's new book. 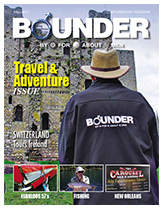 In this issue Bounder travels the world. First Switzerland explores Ireland then we head to New Zealand for a little fly fishing. Davin finds some great whisky in New Orleans plus we bike down to Americade. Bounder does get around. Summer is coming. Woohoo. I'm amazed how many events are happening in our nation's capital this year as we celebrate Canada's 150th. I'm looking forward to attending a few, but a lot of the small towns around the valley are also celebrating, and these ones I really look forward to. 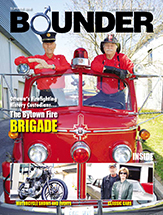 If you are planning to do some exploring this summer, I think that you will find some great information in this issue of Bounder and hope that you get out there and enjoy this great area in which we live and play. Have a great summer…and watch out for motorcycles. 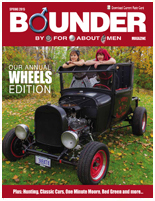 In this first issue of Bounder for 2017, you will find all the vital information you car enthusiasts will need for the car show season We also have some great information on a growing problem in eastern Ontario, namely ticks and how anyone that enjoys the outdoors must pay attention to these Lyme carrying insects. This being the 150th birthday of Canada, there are tons of events happening in our country and I anticipate a very busy summer for everyone. We plan to hit some of the outdoor concerts, especially Kemptville Live. We are also planning a fishing trip to Temagami and the Queen Charlotte Islands in BC. Did I mention that you only live once? This is the fourth and final issue for 2016, but already we have a few stories submitted for the spring Wheels Edition. 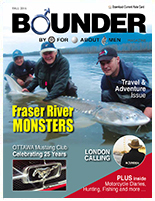 Next year will be our eighth year publishing Bounder and, being the 150th Anniversary of Canada, we have some exciting themes to write about. We have already committed our event trailer and stage and are dedicated to producing an even bigger Bounder in 2017. 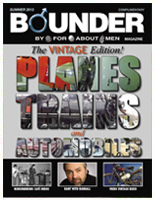 Thank you to all our loyal readers and a huge thank you to our advertisers who, without them, there would not be a Bounder magazine. See you again next year, folks! more suggestions for story lines. The best part is that we already have some of the editorial lined up for the winter music edition that is out early December. It was great connecting with many of you, our readers, at many of the outdoor events that we attended. Looking forward to seeing you at the Ultimate Man Show in November. Until then, enjoy our latest issue. This is our summer issue and, by the time you get this, we will be in full swing into our summer gigs. Watch for us as we head out on the weekends with our event trailer and stage, or our classic truck at the numerous show and shines and cruise nites. We hope to run into you sometime this summer, whether it be the First Annual Bike Event in Westport, the Annual Show and Shine on Fathers' Day in Kemptville, or the 2nd annual Kemptville Live weekend. Ride safe...and watch for motorcycles. Well, it is year seven for Bounder and we are still on a roll. I'm really pleased with this issue. We've got a great line-up of contributors and articles to kick off your Spring. This is our Annual Wheels edition and, once again, we have compiled a list of car shows, cruise nites and clubs. By popular demand, we will continue to produce four issues in 2016 and have already made commitments to attend a lot of shows this year. Maybe we'll see you out there! 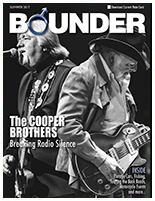 You are reading the first winter edition of Bounder. It only took six years to get up to four editions a year, but here it is. The issue's theme is music and I am pleased to premiere a new feature that will focus on the history of Ottawa and the Valley's country music roots. We have had many fantastic musicians from here that made a huge mark on the music industry. We plan to tell their stories in the next upcoming issues. Man, what a great summer! It seemed that every weekend had so many things to do... too many. This is our first issue themed travel and adventure. We came across some great contributors who gave us some amazing editorial. Unfortunately, we ran out of pages and couldn't run them all. We'll try to run a travel story in the next couple of issues. I hope you like this issue. 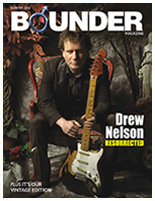 Don't forget we have our music edition will hit the streets in early December. In this issue you'll find a couple of new columns as well as our regular writers. This summer is going to be a busy one for us. We have purchased a portable stage that will be added on to the Bounder/Freedom Harley Davidson event trailer. We will be seen at more events this year as well as the ones we have frequented the in the past and hope to see you out there. In the mean time, enjoy our 'Vintage Edition' and get ready for a great summer ahead! 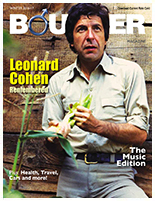 This year is the sixth year of Bounder magazine, and this issue is the first of four we will do this year. This is the annual Wheels edition. 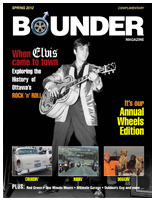 You car lovers will embrace this issue, because it covers all the main events happening through Ottawa and surrounding area. It also brings new articles and writers. 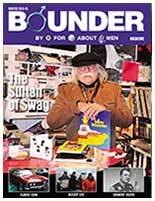 Sit back and enjoy this issue of Bounder. The feedback is very positive that we are doing it right. 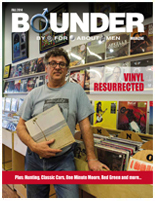 This is our final issue of 2014 featuring the Resurrection of Vinyl. As usual, we have all of your favourite columns in this issue, as well as a couple more thrown in for good measure. 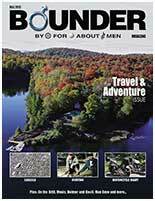 We encourage everyone to continue to give us feedback (good and bad) so we can make Bounder magazine even bigger and better in 2015. Enjoy! 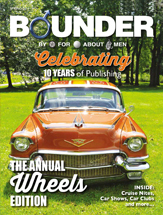 Hard to believe Bounder is celebrating its fifth year. Welcome to our Special Fifth Anniversary Edition. You will see that we continue to work hard to bring you a first-class magazine that begs to be read from cover to cover. We are now into our show and festival season and we'll be out and about again with our Bounder/Freedom-Harley Davidson Event trailer. We hope to see you at one of our trailer events this summer. Thanks for being a reader! 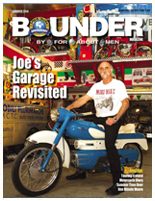 Welcome to year five of the existence of Bounder magazine! We have some artices you won't want to miss like 20 new vehicles for 2014, Duckhunting the Gentleman' s Way, 50,000 Watts of Dave, the return of the Cheshire Cat, how to make the perfect Portobello Mushroom Burger and more. Plus, we decided to feature Larry Way this issue. After all, it's not everyone who gets to travel across North America and hang out with the likes of Paul Revere and the Raiders, The Association and Henry Winkler. 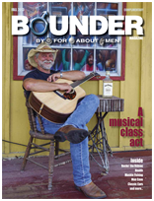 Enjoy reading this "musical edition" of Bounder. You'll notice we have added a couple of new columns as well. We truly look forward to your feedback. Our readers are the backbone of this magazine, and without feedback, good or bad, we don't know how we're doing "out there". Whatever we are doing, right or wrong, we know that copies get picked up pretty quickly. Hard copies seem to disappear faster than we can print them but you can always read it here online. Welcome to our Summer Vintage Edition. This one has been a lot of fun to do. We're getting geared up for another action-packed summer. 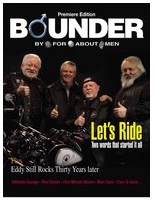 The Bounder/Freedom Harley Davidson event trailer will find us in Merrickville, Kemptville, Calabogie, Bells Corners, and at great events like the Ride for Dad. I would like to welcome a couple of new writers: Art Stevens, who has started a new car column, and Jeff O'Reilly, who will be featuring − well − beer. Our editorial board came up with some more ideas at our last meeting, and as Bounder grows, we'll add them. 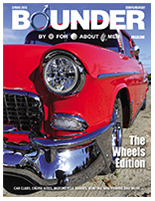 It's year four, and we are very excited to bring you our biggest (and best to date) Bounder. The hard work and dedication from all involved is paying off. This issue finds all our writers back with their columns. Their passion to be involved with a men's magazine shows in their stories. We have more great articles you've come to expect an more in 2013's first issue. Enjoy! 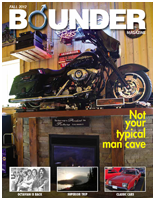 Our last edition of 2012 will have you dreaming of the perfect man cave. If you are old enough to remember 'The Staccatos' or 'Octavian' you are going to take a great trip down memory lane. Plus more Classic Cars, amazing recipes and entertaining articles from our regular contributors guaranteed to entertain, inform and keep you smiling. 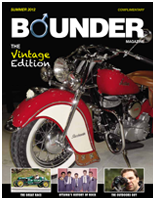 Our June Issue features VINTAGE MOTORCYCLES and CARS. 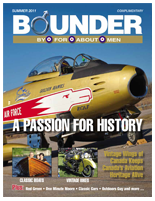 Read about the Canadian Vintage Motorcycle Group with their 80 plus local members. Also, BOUNDER welcomes… The Great Race… to Ottawa! Life with an RV… read why RV's are a big part of many peoples' lifestyle, whether they travel across North America, or set up in a trailer park, RV'ers love the experience! When Rock 'n' Roll came to Ottawa, touring 'Switzerland', the ins and outs of pheasant hunting plus remembering what it is like to have a cold one at the Laff. 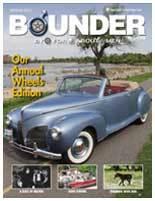 Bounder kicks off 2012 with more of the great articles you've come to expect written with you in mind. And, oh, you gotta try the B.B.Q. pulled pork to start off the outdoor cooking season! Vintage beauties rule the road and why rabbit is so delicious in our third and last edition of 2011. When was the last time you've been to the Carleton Tavern? Read why you should go, how hunting season has just begun plus Red Green • One Minute Moore • Ultimate Garage • Outdoors Guy and more. 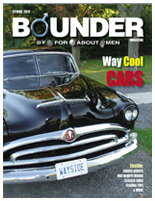 This issue of Bounder is coming out exactly one year after we launched. We have called this edition the Vintage Edition. We have planes (no trains) and automobiles, along with vintage boats, motorcycles and cars. The writers have continued to make every story better. We have continued to add more writers and columnists, I hope you enjoy it. 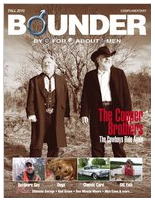 Welcome to our first issue of Bounder for 2011. It is also our third issue to date, just in case you were wondering if you had missed one. 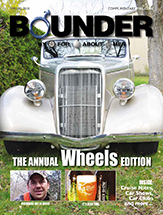 We have named this issue the Wheels Edition. It won’t take you long to figure out why. 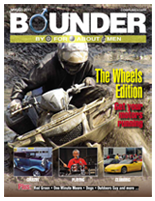 Bounder has formed some new partnerships with the car community, and we have agreed to publish a lot of the schedules for the 2011 car and motorcycle clubs and events. We are doing three issues this year: this one, then number two coming out May 30, and the last one mid-October. The dream didn’t die, The Cooper Brothers ride again. Read about John Switzer – On the back roads, the diary of a monster pike caught and released, Land Rovers, Classic Cars, six tricks for good investing and how to cook venison with Vincent Pucci. Also Scotch (a legendary taste) with Tom McLellan, One Minute Moore with Randall Moore and other interesting features from the same editorial line-up that entertained us in the Premiere Edition. Our Premier issue was a resounding success! Read about how its been 10 years since Garry Janz and Byron Smith decided to organize a motorcycle ride to raise money for prostrate cancer and what they decided to do next. Find out how Eddy & The Stingrays have endured the ups and downs of greasing down their hair at night, and working their real jobs during the day. Plus grilling tips, cars. Man Caves, Ultimate Garages and humour with the likes of Red Green and Delmar and Cecil. We welcome all your thoughts and ideas -- positive or negative. Click here to send us your suggestions.